I believe I have the dimensions sorted out for my new workbench. Thanks to Chris Schwarz' two workbench books and the dimensions he provides for his Roubo, working out the measurements was much easier than starting from scratch. I've decided on poplar for the base of the bench. The top will be cherry. I realize that poplar might not hold up as well as the cherry, but if I need to tighten the through tenon and dovetail in the top over time, that's okay. Poplar is readily available in 16/4 and is priced to please. This is going to be my main bench and my travel bench which means that on rare occasions it will need to be broken down. Rather than make something lightweight for travel, I decided to make the main one more portable. The top will be made up of two 12/4 slabs that are not glued together. Because of this, I added two short stretchers beneath the top--one at both ends. The four short stretchers will be mortise and tenoned and glued into the legs. I'm not a fan of metal fasteners, so the long stretchers will be connected to the legs with wedged through tenons. I figure I'll be able to remove the two top pieces and remove the long stretchers, but leave the two end assemblies in tact. I *think* I'll be able to carry them. The front vise will be a leg vise, and I think I've settled on a shop made wagon vise for the end. The overall dimensions are 19.75" deep x 58" long x 33.75" tall. Those may seem like weird dimensions for someone who's only 5' 5", but they are very similar to the cheapie bench I've been using for almost two decades, so I've become accustomed to them. All my jigs and two shop stools work with this size, and I've never found that I needed a longer or shorter bench. I don't plan on building large pieces, but if I do, I can slide my cheapie bench up end-for-end with the new one. I plan to add a sliding deadman and put a shallow, removable tool box between the bottom stretchers. Now it's time to go lumber shopping again. We're off to Groffs Lumber tomorrow and hope that Hurricane Irene doesn't rain on my workbench parade. Poplar and cherry is a nice combination. Are you planning a gap between your top boards? Otherwise seasonal movement will cause them to bind. 16/4 poplar is readily available? I need to move to Pennsylvania. Can't wait to see the bench progress. You might consider Ash for the base. It's about the same price as Poplar, but because it's harder it will stand up to the racking forces better. It looks really nice with Cherry too - I guess that's why Thos Moser uses that combination in his chairs and stools. I got all my Ash from G&G. Tell them you want to see the good stuff they keep in the other building. Looks great, Kari. You'll get years of great use out of it. Oh goodie! Can't wait. When you get there, can you please do little splainin' or at least a pic or two of the wagon vise. I need to do something like that. I'd love to see what you do. Hope you get to go lumber shopping tomorrow! ditto Mark H on the Ash. Mine has an ash base and it's the most solid part of the bench. I often use the tenon and dovetail endgrain on the top of the bench for anvil-like uses, among other things. Not sure of the availability in 16/4 near you, but its pretty inexpensive and will last ALOT longer than poplar, and IMHO, contrast better with cherry than the poplar will. My money is on you kid. I bet it comes out swell! Darnell, I was planning to leave a gap and figured I could shave off the edges if they get too tight. I can always add a gap and spacer insert down the road if necessary. I haven't quite finalized all the details, but have enough to buy the lumber. Mark, thanks for your advice. I will take a look at the Ash while I'm there. I prefer the more subtle grain pattern with Poplar, but maybe they'll have some quartersawn stuff. Marilyn, I'm just going to consult the Internet for making a wagon vise. There is lots of good info out there, especially on the forums. It looks a lot easier than making an end vise. Nick, thanks for chiming in. I will take a look at the Ash, which is available in 16/4. I'm trying to avoid gluing up boards, if possible. Darned iPad keyboard. I meant to say that I do not plan to leave a gap between the two top boards. I knew I knew you from way back in my college sketching class. Wink. Hi Kari - I'm sure you've already thought this through and fully decided upon the wagon vice, but if that sliding tail vice in the doodle is your common-or-garden quick release gizmo instead of something clever then its undercarriage will likely bump into the stretcher. The collapse-able top is exciting. I made my first bench loosely in the Schwarz style and have to say that I've been really pleased with it. There are a few tiny details I'd change, but I'm in no hurry to build bench 2.0 - that's a nice feeling. Kari, the design looks great. No matter how many bench builds I see, I'm always excited to see more. Thanks to Schwarz, this has really become a common project for modern woodworkers. I'm not trying to talk you out of the wagon vise, but you may want to consider a quick release vise for the tail position. In particular, check out the Sheldon vise that Schwarz has on his "Petite Roubo". One big advantage for a travelling bench is that this vise can be instantly slid off the end of the bench to reduce weight. Check out these videos posted by Dyami - Schwarz giving a tour of the bench. Details on the Sheldon vise are in the second video, at about the 5:30 mark. RonW, the life drawing classes were the best, weren't they? Jason, at first I thought I'd go with a regular end vise, but am really leaning toward the wagon vise. I need to read up on it more, but I *think* I'll be okay with a 10" overhang on both ends of the top. I haven't started cutting yet, so I can change that dimension if need be. What kinds of details would you change on your Roubo? Aaron, I'm with you. Any book on workbenches or anybody's bench build gets my attention. I'll take a look at the video--thanks for the link. There are a couple things not yet set in stone, but I had enough things worked out that I could at least buy lumber and start getting it acclimated to my shop. See you at WIA! Kari, seems to me if you make the top removable, the joints shown will have to be so loose as to make the top unsteady on the base. If you fit them as snug as they should be, something will move and they will be locked in place. At least that is what most builders who use that joint hope for. Good Luck! I also did a quick-release tail vise (Veritas). It didn't *quite* go as smoothly as expected, but came out fine. I think I might do the Benchcrafted tail vise with the captured screw if I were to do it over again... Partly because I love the Benchcrafted leg vise so much, and partly because I couldmoperate it with the right end of the bench almost flush to the wall. It also let's me clamp drawer sides free and tight for Dovetailing, which I like - even it it's not traditional. I also made several tool carriers that fit on the lower stretchers/shelf, for sanders, pin nailers, and other supplies. On a traveling bench, I'd still go with the Benchcrafted leg vise; it's easy to remove and pack separately. Drawbored pins of rived oak can always be drilled out to move it or replace the top. As I finish my bench, I may come to envy yours - especially that cherry. 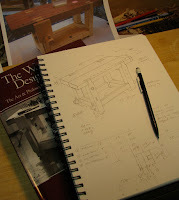 I love the design - the wagon vise drawing is elegant - and I think she'll be beautiful. What's her name? "What kinds of details would you change...?" I did the planing stop that Mr Schwarz did too. I wouldn't bother next time - another dog hole would be just as good and less bother all round. A little change I made from scratch was to simplify the joinery - the stretchers below are made out of a laminate of two planks glued together: the inside plank is longer, forming tenons, but also narrower, forming the seat for a shelf. Having a shelf below is brilliant. Laminate construction can make the joinery a cinch. Just wondering....why is it called a workbench, when what it really is...is a table. Ross, I love the tool carrier idea, too. I thought I'd put a removable shallow one that doubles as a shelf. The bench does not have a name yet. I figure he/she will let me know during the build. Jason, nice to know I'm not the only one who makes mistakes! Jes, I don't really know. But among the first workbenches were those used by the Romans, which seem to be very low to the ground. Maybe they really got their start as benches on which you sit and work, and the name stuck. I got to start making sketches like that, I normally have to stare at the paper for about 10 minutes to figure out what I had drawn. Can't wait to see the final bench, maple and cherry is probably my favorite wood combination.